The perfect light effect for your Halloween party. 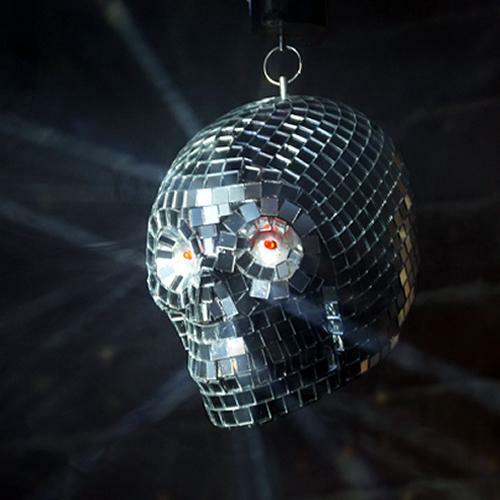 This skull shaped disco ball spins from its own motor, it's easy to set up and simple to use. Mirrored mosaic glass tiles cover the 8 inch skull, and it also has red light up LED eyes for an added scare. Motor requires 1 D battery and 3 AA batteries, not included. Disco balls have got to be the ultimate shiny object and this one even has glowing red eyes. It also even comes in the shape of a spooky skull. It?d be great to pick up for either this year?s Halloween party or just anytime you?re in the mood for a goth themed dance. After all the goth kids can?t have just any normal disco ball, it has to be slightly different so as to not get confused as one of the other average joe dances. The mosaic glass may look the same as it does with every other disco ball, but thanks to glowing eyes and an odd shape it sets itself apart from the rest.